One of the most beautiful train rides in Japan, the Resort Shirakami train travels between Aomori and Akita, following the scenic coastline of northern Tohoku. The JR Pass can be used on the Resort Shirakami train, all you have to do is sit back and enjoy. Resort Shirakami train is a so-called “Joyful train”, these are trains which you ride for the pure enjoyment of seeing the landscape pass by while being emerged in onboard entertainment and other facilities. The train travels past the Tohoku coastline, giving rise to magnificent panoramas, sunsets and UNESCO designated mountain range of the Shirakami Sanchi (this loosely translates to land of the white mountain Gods). All seats on this train are reserved so make a reservation before boarding the train. The Buna train on the Shirakami service. The Aoike Train on a Shirakami service. The train operates a 2 by 2 seating arrangement with one train car having a 4 seat arrangement for larger travel parties.". While there are no Green Seats on board, normal seats are much nicer than you would find on any normal train. 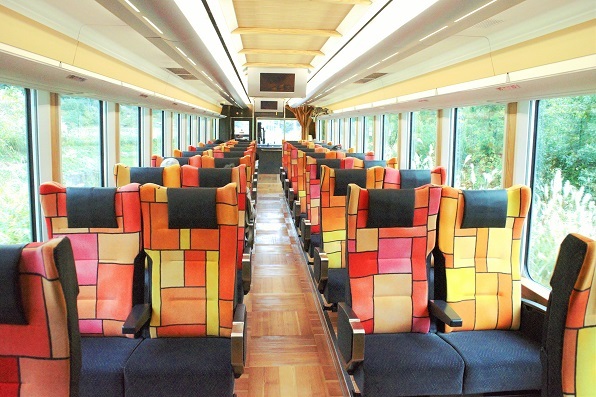 You will find a bar and small art gallery in the middle of the train, selling local delicacies from different stops along the way and small art, such as pottery and craft works. You can also taste different local Japanese Sakes (rice wine), purchased from the bar. While I did not try any of the alcoholic drinks, the local Hirosaki Apple juice and sweet potato chips were perfect. Some trains have live storytelling on board, others have live music or art performances. The train also makes a 15 minute stop, where passengers can get off the train and walk the local beach. It truly is a magic experience. Coach seating with 4 seats and table. The Resort Shirakami train travels up and down on the Ou and Gono lines. A full route map can be found below. Resort Shirakami as a day trip from Tokyo: Ride the Green, Red and White! This could be a blog post on its own. It is possible to enjoy the Resort Shirakami as a day trip from Tokyo. This also includes a ride on the Komachi (red) and Super fast Hayabusa (green) Shinkansen. The route is as follows. Take the 10:20 Hayabusa service from Tokyo to Shin-Aomori (arrival at 13:29). From Akita, take the 19:11 Komachi service to Tokyo (arrival at 23:04). The total cost would be around ¥39,360 but is free with the JR Pass! The cost of a 7 day JR Pass is only ¥ 29,110. Trips like these really show the potential of the JR Pass. Fair warning for those who want to do this, you will be spending the whole day on the train, be sure to be prepared.